Saturday, July 28, 2012 and Saturday, November 24, 2012. 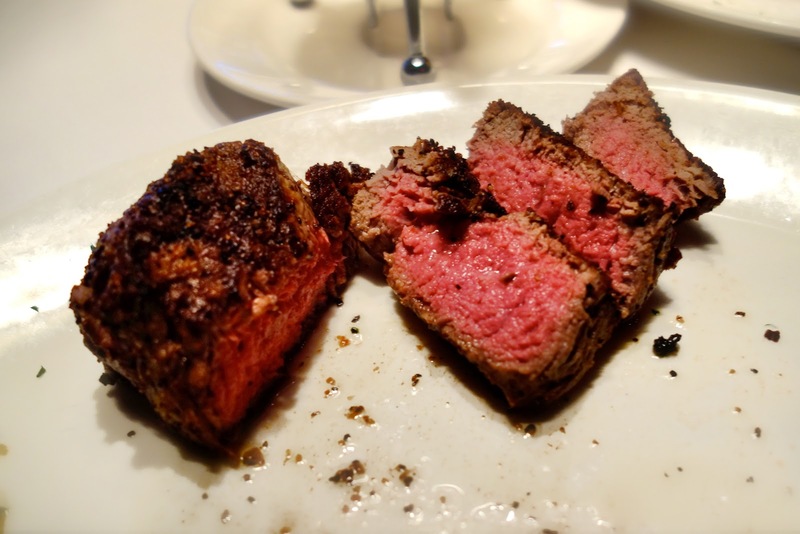 In the past two years I’ve tried a half-dozen upscale steakhouses in the Boston area. My favorite is Del Frisco’s Double Eagle Steakhouse. The restaurant opened in 2011 on the Seaport, a newly trendy neighborhood that has attracted a lot of restauranteurs. Del Frisco’s dining room boasts an unbeatable view of the waterfront and Boston’s skyline across the bay. Visit for the view, stay for the meal. Del Frisco’s is Boston’s hippest steakhouse. It’s popular with the corporate crowd during the week, and on weekends it’s a “date night” destination full of people dressed to impress. The water view is dazzling and the dining room is designed to match, in every aspect including the servers’ attire. Most importantly, the top-notch food backs up its high prices. 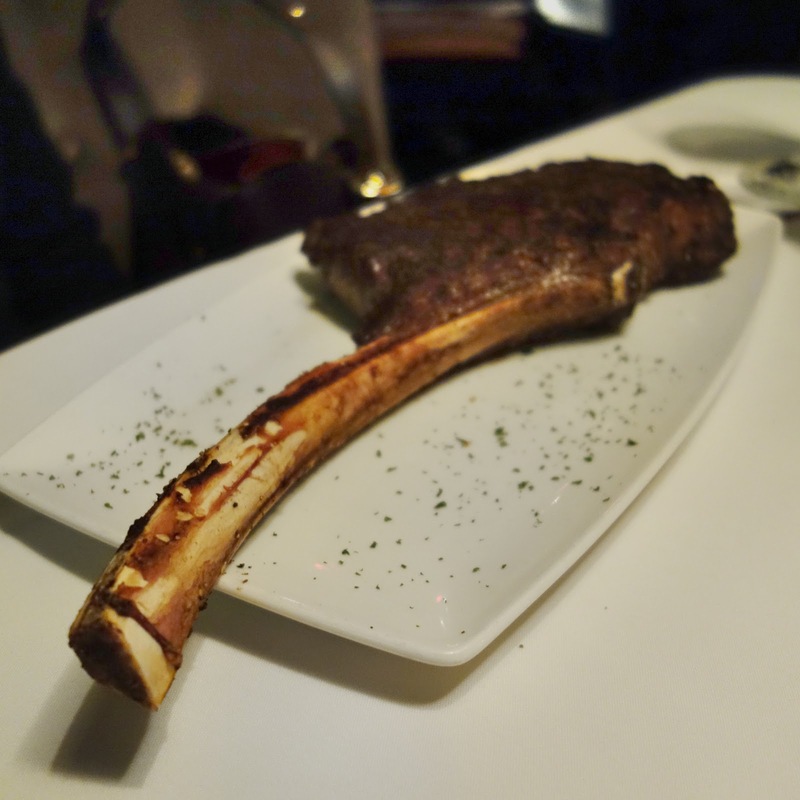 I think Del Frisco’s caters more toward the younger twenty- and thirtysomething urban professionals more successfully than other steakhouses in the area, and without losing the classic authority of being A Steakhouse. Del Frisco’s is cool, it’s trendy, and it knows it. Del Frisco’s Double Eagle Steakhouse in Boston. Saturday, July 28, 2012. We started with appetizers of tuna tartar and crab cakes. I always hesitate when ordering tuna tartar because it’s one of those dishes that varies wildly depending where you are, so much that it’s hard to know what to expect; but I loved Del Frisco’s dish. The tartar itself ($16) was accompanied by crispy crostinis that were each garnished with a tiny sliver of red pepper, all atop a piece of lettuce. 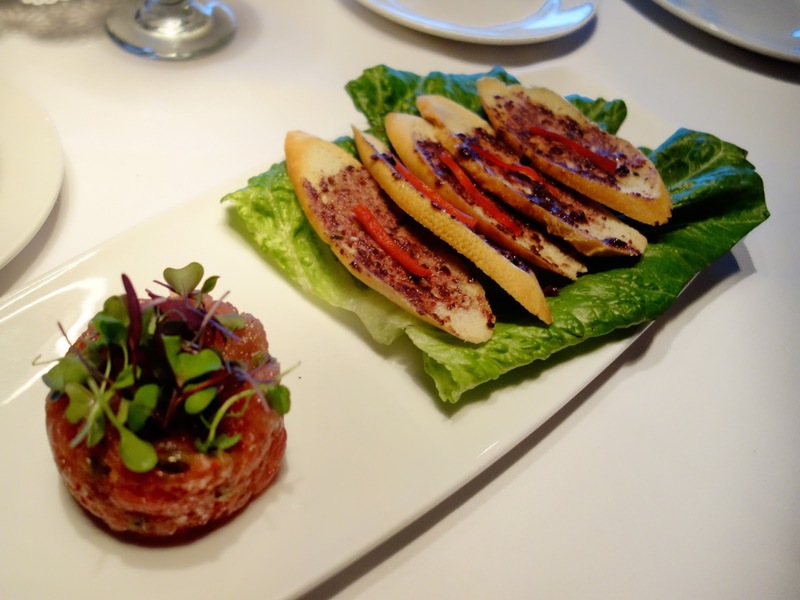 Del Frisco’s tuna tartar with crostinis. 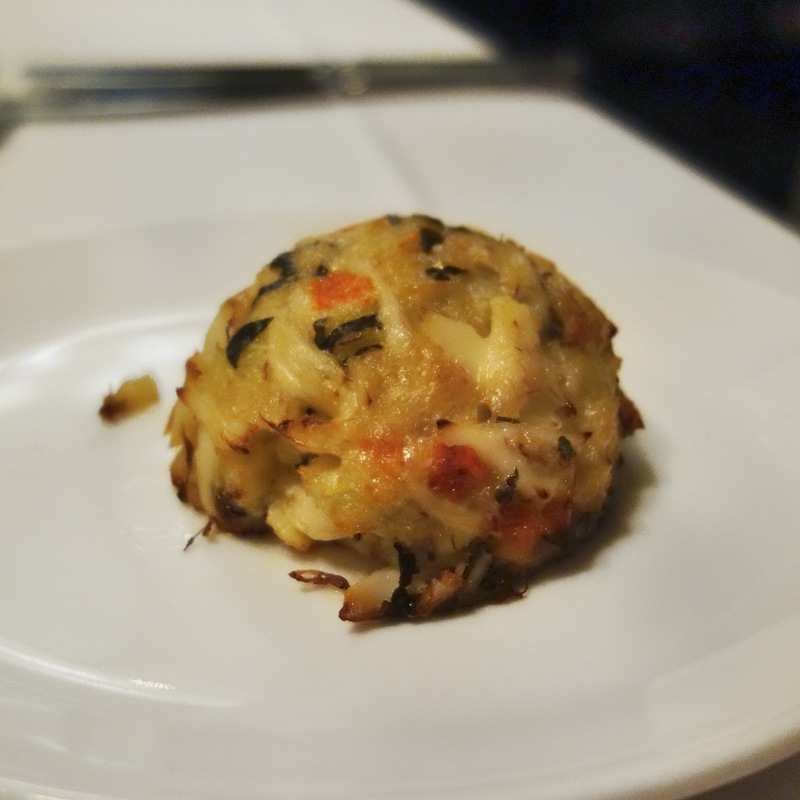 Del Frisco’s crab cake appetizer ($19) is oven-baked rather than fried, so there was no greasiness whatsoever. The chunks of crab meat managed to hold together as a large cake without using much (any?) mayonnaise. My sauce-averse boyfriend ordered the crab cake without the Cajun lobster sauce it usually comes with. This was his first time ordering this appetizer, and he ordered it again on our next visit, which I interpret as endorsement. Del Frisco’s crab cake appetizer, without the Cajun lobster sauce. I wish I knew steak better. For most of my teenage years I was vegetarian, with the sporadic and unexplained exceptions of canned tuna or salmon. I have been an omnivore for about two years now. At steakhouses, I typically select the filet mignon because it usually comes in a relatively small cut and I like the texture. I go for the 8-ounce, or sometimes 10-ounce if I am especially hungry. More than that and I know I’ll end up leaving too much meat on my plate. My filet mignon (8 oz, $39) was excellent. Now, for my philosophy about steakhouses. When you walk into a first-rate steakhouse you are going to find uniformly high prices, for which you expect excellent quality steaks that are expertly cooked. That’s baseline. It is what separates steakhouses from all the other restaurants in the field that just have steak on the menu, rather than specializing in it. But among those first-rate steakhouses, the features that distinguish them and create the real “wow” of a meal are whatever other appetizers, sides, and entrees a steakhouse offers. Enter, the giant lobster tail and legendary onion rings. I was introduced to the concept of surf-n-turf (more or less) at the Melting Pot and have been obsessed with the steak-&-lobster combination ever since. Hands down, Del Frisco’s does it best. Here is my strategy: I order a steak for myself, and I make sure my boyfriend orders one too. Then I convince him to split a humongous lobster tail with me, which isn’t hard because he loves steak-&-lobster as much as I do. When the food arrives, I position the lobster tail as close to me as possible and hog it. That is my strategy, and I’m certain it’s how Napoleon won wars. The lobster tail’s sheer size will impress you even before its flavor. My boyfriend tells me that there are actually larger lobster tails out there and that I am overstating the size of Del Frisco’s lobster tails, but I haven’t seen any bigger lobster tails yet so I’m not going to let him rain on my parade. 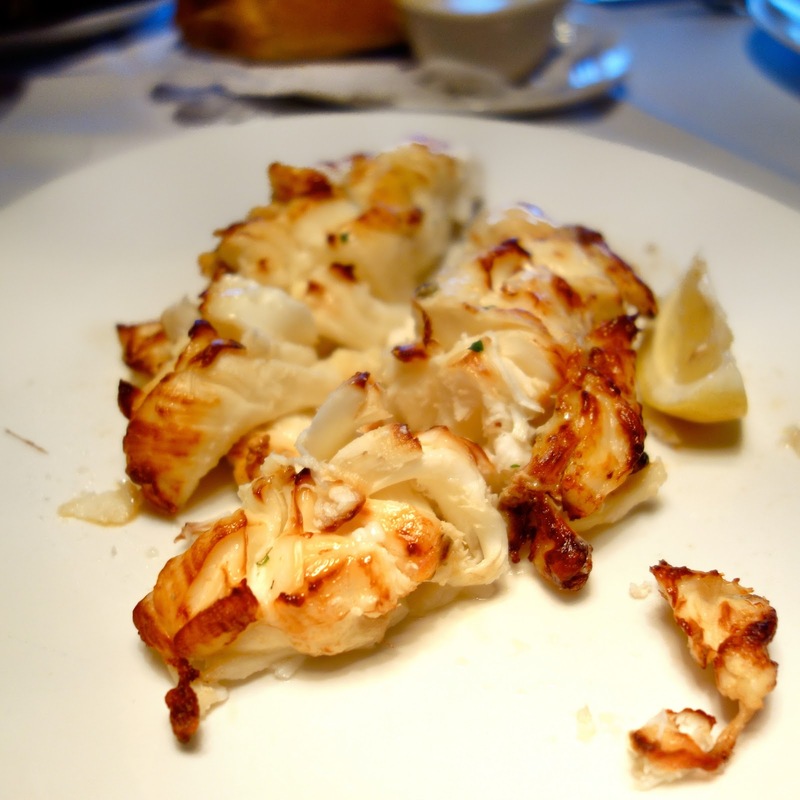 I will continue to describe the Del Frisco’s lobster tail as “sea-monster huge.” It’s awesome. On this visit we splurged on the extra-huge 20-ounce lobster tail for $120, over the 18-ounce for $108. I’ll admit, the larger size ended up being a little much for my boyfriend and I to realistically share with our steaks. But it was delicious, and next time around we knew to go with the smaller portion. 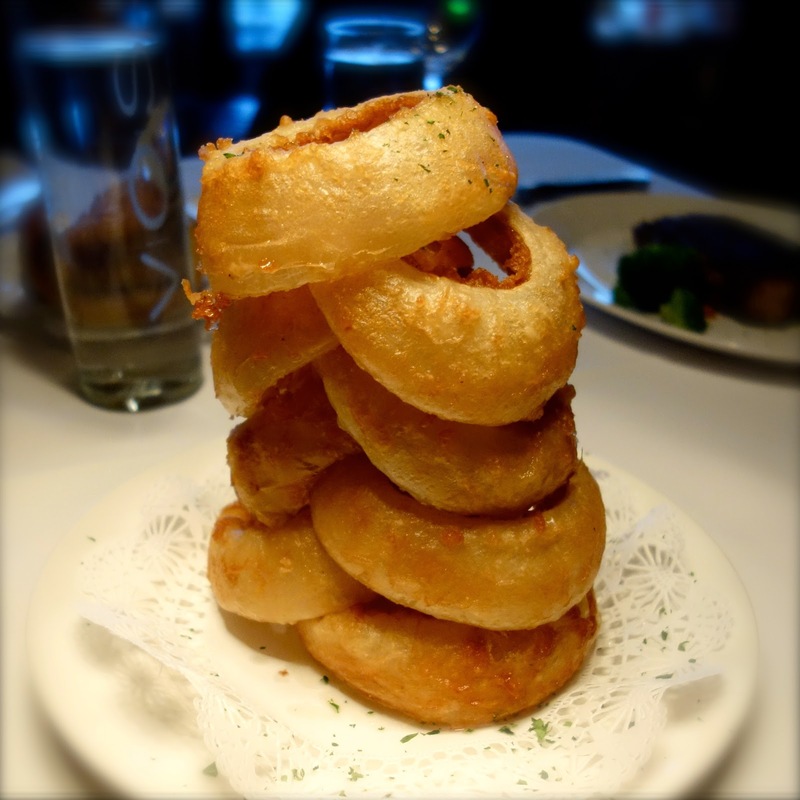 Del Frisco’s incredible onion rings. 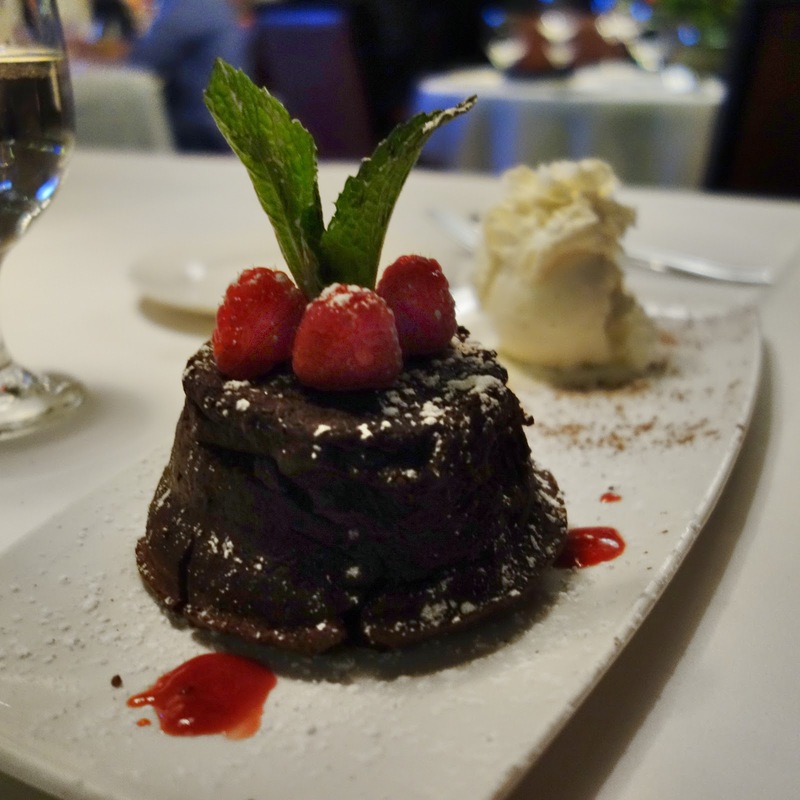 Every restaurant needs at least one really good chocolate dessert, and at Del Frisco’s you can’t go wrong with the simple chocolate soufflé cake ($11). My boyfriend and I each got our own. (No, we don’t split desserts. And if you’re eating this chocolate soufflé, you won’t want to either!) The soufflé with its molten center is topped with raspberries and a sprig of mint, and accompanied by vanilla ice cream, whipped cream, and a little raspberry puree. There’s no better way to top off an evening than with chocolate, amirite? Del Frisco’s chocolate souffle cake topped with raspberries and a sprig of mint, accompanied by vanilla ice cream. Saturday, November 24, 2012. My most recent visit to Del Frisco’s was a treat for his mother’s birthday. She loves Del Frisco’s. We made our reservation roughly a month in advance. It should be noted that if you’re planning to dine at Del Frisco’s on a Friday or Saturday in the 5:30–8:30pm range, then you should try to book at least a couple weeks out. They fill up. I spent the next weeks anticipating an evening of mouthwatering steak and lobster and onion rings, and I was not disappointed! The dining began as it typically does for me, with indecision as I pore over the menu wishing that I had a second stomach (and bank account) so I could try more food. In this case, I managed to narrow my appetizer selection down to two possibilities, the fried oysters ($15) or the smoked chicken and andouille gumbo ($10). I asked our waiter for his opinion. He advised me that the fried oysters would be more filling; and so, appreciating how much more food I’d be having, I went with the gumbo and ended up very happy with my decision. The gumbo’s generously-piled pieces of pulled chicken did indeed give it a smoky flavor, while the topping of rice added diversity to the texture. The chicken-and-andouille proportion was a bit heavy on the chicken, but honestly, I didn’t mind. The dish had a twinge of Southern hotness to it: enough to catch my attention, but not enough to burn. 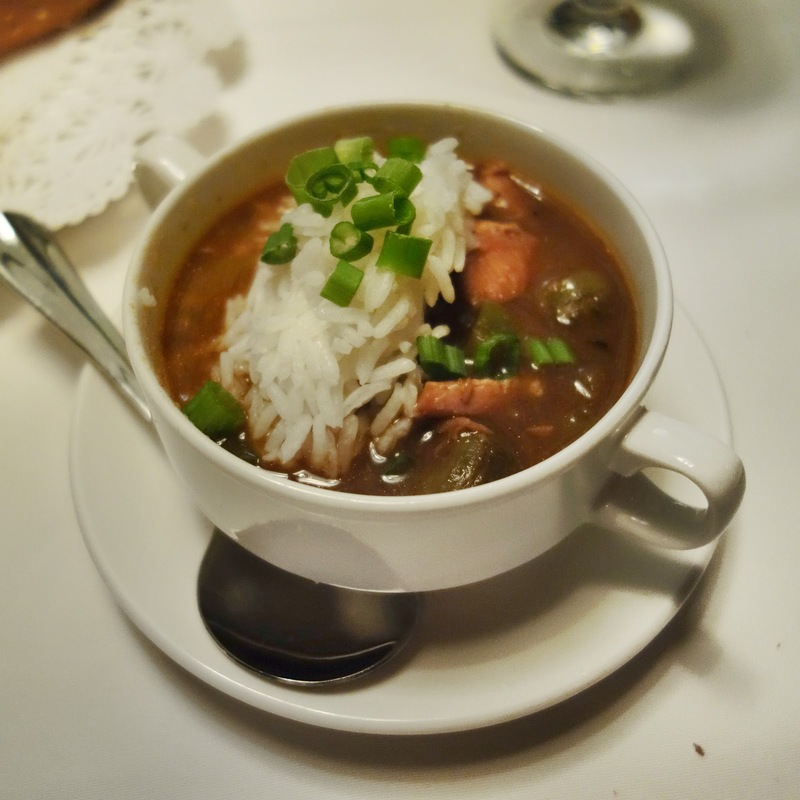 Del Frisco’s smoked chicken and andouille gumbo. Most of Del Frisco’s steaks run in the $45 to $55 range. The wagyu stands out on the menu page at $89, but being 32 ounces, it’s big enough to split and doesn’t end up costing more per person than the other steaks. I’m not a steak expert, but I have read a bit about what you are actually paying for when it comes to wagyu and kobe beef. I’m not a total rube. Regardless, I absolutely the wagyu at Del Frisco’s. It arrives bone-in. We watched as the servers cut it off the bone in front of us, all hot and juicy and wonderful. Del Frisco’s 32-ounce bone-in wagyu beef. Okay, so it’s hard to get a good photo of steak, but just trust me when I say that it’s good. Keeping in mind how we hadn’t been able to finish the 20-ounce lobster tail on our last visit, we went with a smaller 16-ounce lobster tail this time around. It ended up being the perfect amount for all three of us to accompany our steaks. 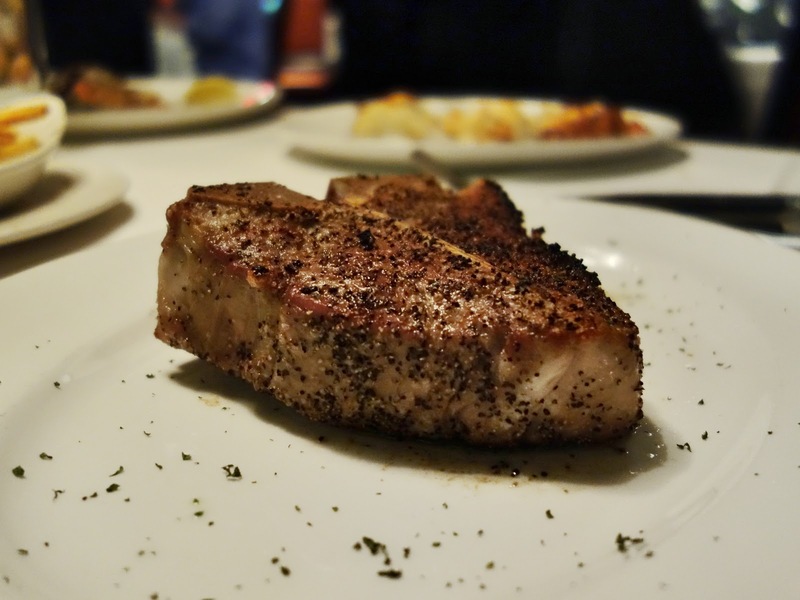 My boyfriend was curious about the veal porterhouse steak ($44) and ordered it, partially because he knew I’d be blogging and this wasn’t something either of us had tried before at Del Frisco’s. The veal was pale in color and quite delicate in flavor, especially in contrast to the richness of the wagyu. He was surprised by how much he genuinely liked it and said he would order it again in the future. Del Frisco’s veal porterhouse steak. Because we had a birthday in our party, the waiter brought out a piece of the most rich and creamy cheesecake ever to grace my palate. 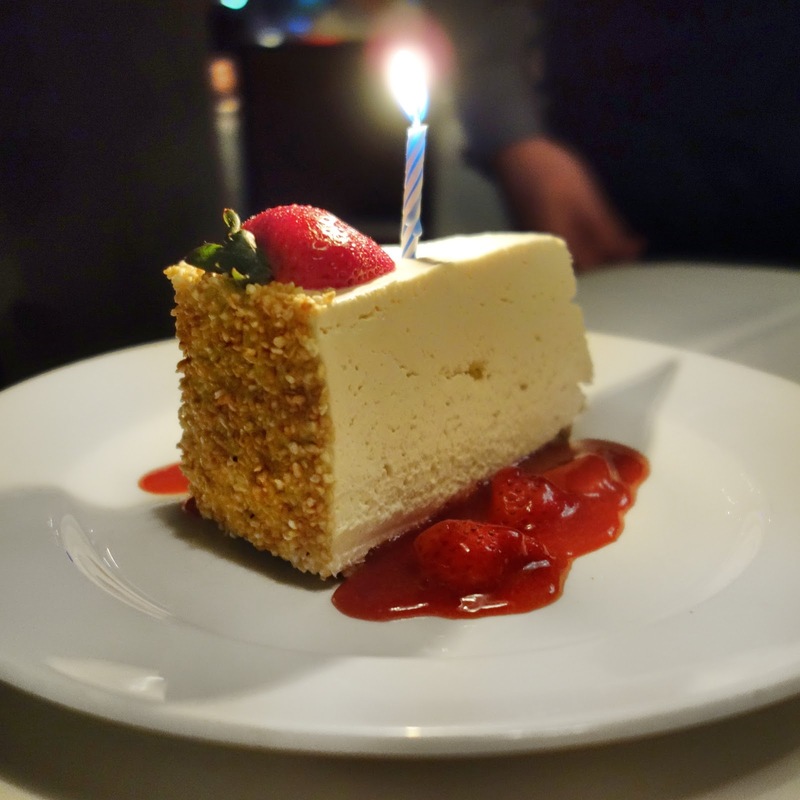 I don’t know the particularities of how the cheesecake is made beyond that it is hand whipped and eggless, but whatever they’re doing in the Del Frisco’s kitchen, they are doing cheesecake right. But then it came time to select my own dessert, and once again, I hit a brick wall of food-blogging indecision. I asked the waiter which he’d prefer between the banana bread pudding or the praline parfait. He said he was partial to the praline parfait ($9), and after how much I had liked the gumbo earlier, I didn’t hesitate to trust his judgment. I was not disappointed! Vanilla ice cream, pecans, and caramel rum sauce topped with whipped cream in a glass. You know you’ve found a home-run dish when you can just list its ingredients and stop there. 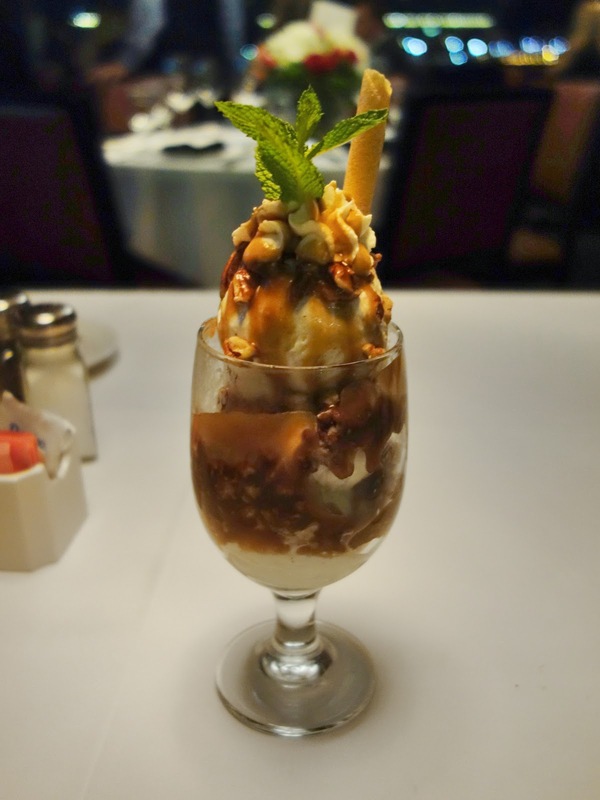 Del Frisco’s praline parfait with vanilla ice cream, pecans, and caramel rum sauce, topped with whipped cream. There are plenty of upscale steakhouses in Boston, but Del Frisco’s is my favorite. Over several visits the food has been consistently phenomenal and the service outstanding. 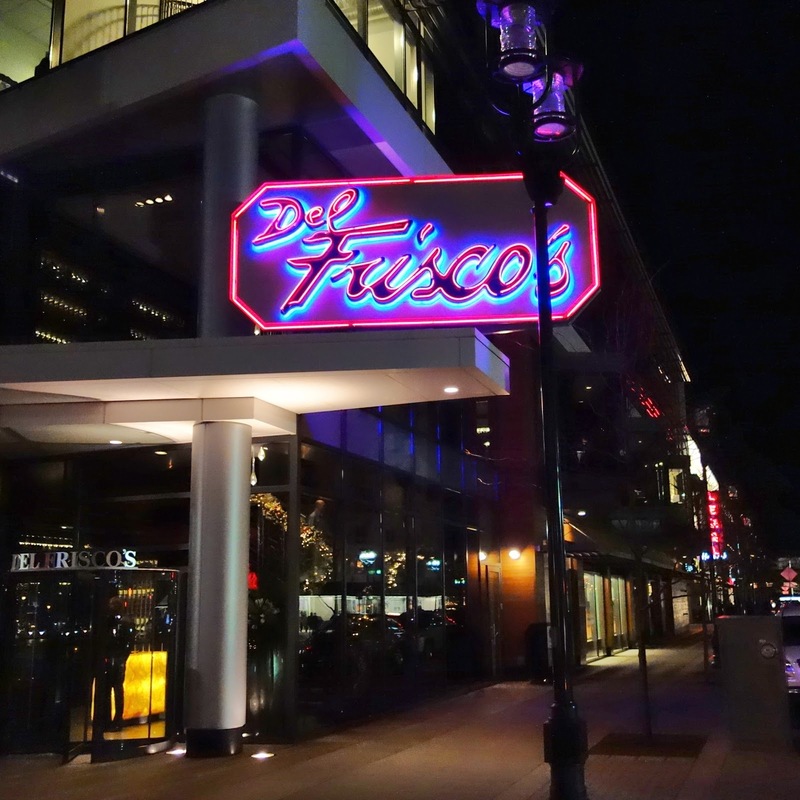 Del Frisco’s is expensive enough that many people will save it for a special occasion; but for those special occasions, it’s well worth the price.